Minnesota loves a good mystery. The state is home to dozens of mystery writers who can't resist using the woods, the lakes and the Twin Cities as the site of their chilling tales. Writers seem to revel in covering Minnesota's most picturesque places with fictional crime-scene tape. No place is safe. The summer cabin on the North Shore, the ice-fishing house out on the lake, the Stone Arch Bridge, even the State Fair — local murder mysteries have made crime scenes of all of them. So what is it about the land of 10,000 lakes that inspires such dark tales of murder and mayhem? It could be the cold. The recent boom in Scandinavian crime fiction suggests that chilly climates could lead to chilling fiction. Stieg Larsson and Jo Nesbo, from Sweden and Norway respectively, became international best-sellers with their dark and twisted tales. Blame the subzero temperatures for their cold-hearted approach to killing off characters. It could also be the flip side of "Minnesota nice." Nice to your face — cruel on the page. The work of many local writers makes you wonder what's lurking behind people's polite behavior at the potluck. Whatever the root of Minnesota's taste for murder mysteries, the bookshelves have such a high body count, there's something for everyone: darkly comic, deadly serious or ripped from the headlines. Sundstol hails from Norway, but he set his award-winning mystery trilogy in Minnesota. The author lived for several years along Lake Superior, and his books unfold in the small towns and towering forests of the area. The first book in his series, "Land of Dreams," opens with a U.S. Forest Service stumbling across the bodies of two Norwegian tourists on the lakeshore. Drop down into the sordid and seamy side of Minneapolis and St. Paul with this anthology of noir-inspired stories. Local authors like William Kent Krueger, John Jodzio and Brad Zellar romp through the cities' underbelly with plenty of grit and a dose of dark humor. From Frogtown to Linden Hills, no neighborhood is safe. 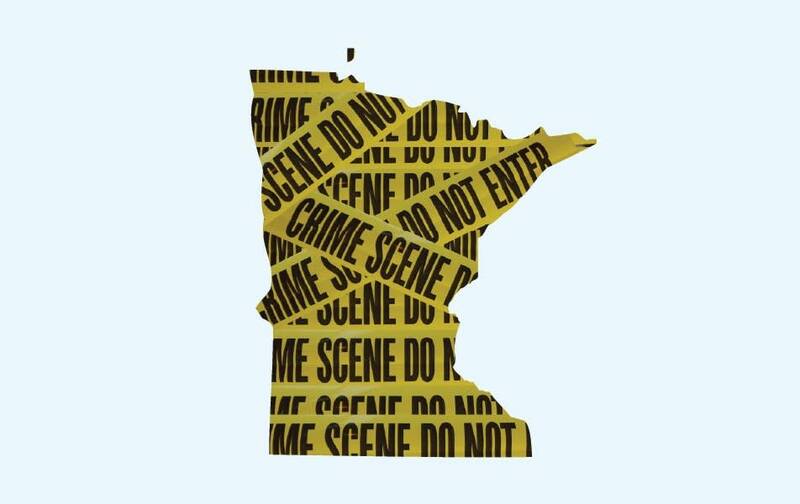 Krueger, Hart and Brookins make up "The Minnesota Crime Wave" — a group of three prominent Twin Cities mystery writers. They've edited three anthologies of local mystery stories together, tapping other authors from around the state to contribute. The group has never shied away from a bad murder or a good pun: "Resort to Murder" is their second collection, "Silence of the Loons" was the first. The brutal cold of northern Minnesota comes through in this story of family secrets. Seventeen-year-old Jesse finds his father dead of an apparently self-inflicted gunshot after the two go out hunting, but he refuses to believe his father actually pulled the trigger. Shades of "Hamlet" unfold in Enger's stark prose. Nothing like a corpse with a side of casserole. Cooney mixes recipes into her murder mystery, which follows cub reportre Emerald Malloy as she travels up north. In the Red River Valley, she uncovers an old, unsolved murder she can't resist pursuing. This story is a Minnesota mystery down to the last detail: It centers around the State Fair and food on a stick. When the inventor of a brand new stick-bound treat is poisoned, a reporter must solve the mystery before murder spoils the fair. Guy Noir may be the most famous detective in Minnesota, thanks to Keillor's regular sketches on "A Prairie Home Companion." In "The Straight Skinny," Keillor expands Noir's adventures from just a few minutes on air to a full novel, complete with Keillor's trademark brand of humor. Krueger is a legend in the Minnesota mystery scene. For years, he could be seen writing his novels out by hand at the St. Paul Broiler. "Thunder Bay" is the seventh novel in his Cork O'Connor mystery series, which follows a retired detective as he sets up shop as a private investigator in Aurora, Minn. O'Connor is asked to find the long-lost son of a local Ojibwe man, but the case comes with unexpected dangers. This mystery unfolds with a nudge and a wink: Landon mixes comedy with murder when a body turns up in one of the stately homes on St. Paul's Grand Avenue. The detective on the case knows he's not talented enough to solve it, so he hires own investigator. Anyone with a British accent must be like Sherlock Holmes, right? Sanford's best-selling series about Minneapolis detective Lucas Davenport is now up to 25 books. "Invisible Prey," No.17, is as good a place as any to dive in. Two victims are found bound and murdered in Minneapolis' richest neighborhood. What seems like a random robbery turns out to be anything but as Davenport stumbles on a shocking pattern. St. Paul writer Housewright has won both the Edgar Award and multiple Minnesota Book Awards for his mystery novels. His most well-known series follows Twin Cities private detective Rushmore McKenzie. In his latest book, McKenzie gets thrown into an investigation when the truck in front of him drops a body right in front of his car on the highway. Sherlock Holmes in Minnesota? That's right. Millett weaves a tangled tale of the eccentric detective in the land of lakes. In the book, Holmes and Watson arrive in Minnesota on the heels of a dangerous arsonist who is threatening the Great Northern Railroad and its owner, James J. Hill. Millett tosses in real moments of Minnesota history, using the Hinckley forest fire of 1894 as a backdrop for his tale. When Hart started her Jane Lawless series in 1989, she was one of the first writers to include an openly gay main character as her detective hero. She's since been hailed as "the lesbian answer to Agatha Christie". In her series, Lawless is a fearless Minneapolis restaurateur with a knack for solving crimes. In "Faint Praise," the sixth Lawless book, she investigates a string of deaths in the shadow of Minneapolis' Foshay Tower. Step back in time for some dark moments in Minnesota history in this nonfiction collection. Trenerry chronicles sixteen murder cases in the state from 1858 to 1917. Phalen is a name any Twin Cities resident knows: Lake Phalen, Phalen Creek, Phalen Elementary... These landmarks are all named for Edward Phalen, one of the first settlers of St. Paul. He's also the main suspect in the oldest murder mystery in the state. Brueggemann, using documents unearthed at the Minnesota Historical Society, digs in to the 150-year-old murder that still hasn't been solved. The Glensheen Mansion in Duluth is an architectural wonder — and the site of the most infamous murders in the state. In "Will to Murder," a Minnesota crime reporter, a Duluth police detective and a county prosecutor team up tell the story of the crime and the trial that followed. What's your favorite Minnesota mystery? Add your favorites in the comments below.